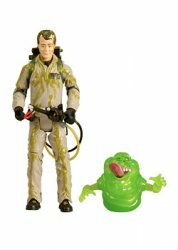 IN STOCK READY TO SHIP "No job is too big, no fee is too big" for Ghostbusters team member Billy Murray's Peter Venkman available here! "No job is too big, no fee is too big" for Ghostbusters team member Billy Murray's Peter Venkman! Quickly SOLD OUT at MattyCollector, but available here in very limited quantities! This long-awaited representation from the original film arrives ready to show those exasperating ectoplasms how things are done downtown with a light-up removable proton pack. 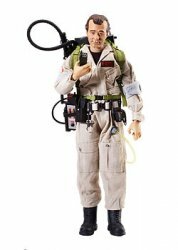 Mattel's movie-accurate and fully-articulated 12" tall Movie Masters� figure also comes with a walkie-talkie, extra hands, a real cloth outfit, and ghost trap. Collectors Note: Brand-new and factory sealed. The colorful artwork and design of the display box itself is just as detailed as the figure. The last photo shows the mural that is formed when all four 12 inch Ghostbusters boxes (Venkman, Zeddemore, Stantz, Spengler) are placed next to each other.